Mark Lansdown discusses collectible comic character advertising pinbacks. Based in Denver, Colorado, Mark can be reached via his website, Comic Character Pinbacks, which is a member of our Hall of Fame. I started off collecting comic books, and still do, but I’d been given a few early Disney pinbacks as a child and always thought they were interesting. In the early 1990s, I started getting Ted Hake’s excellent auction magazine, and I enjoyed browsing his pinbacks listings. Then about 10 years ago I bought a couple of early Yellow Kid pinbacks at a flea market and that’s what really got me started. The obsessive compulsive collecting behavior kicked in from there and I just started collecting full force. I’ve built a pretty sizable collection of comic pinbacks, and now that I have all the really common ones, I’m looking for the rare pins. Collecting is like an addiction, which makes it easy to start collecting pinbacks from other areas. I’m really interested in a lot of the turn of the century advertising pins; some of the graphics are quite beautiful. A lot of times, pinbacks were given away as premiums with cigarettes or newspaper subscriptions, or they were handed out at stores as advertising. They were also given as club premiums, so if a kid sent in some box tops to his favorite radio sponsor, he might get a pinback as part of the club membership package. On the political side, they were given away at rallies and used for campaigns. Pinbacks were just a small and inexpensive way to get your brand out there. They attached to clothing so it was easy to wear them and advertise the product. And the fact that they were given away with presidential campaigns gave them more credibility as a promotional device. Collectors Weekly: What are some of your favorite pinbacks? Lansdown: The comic characters are near and dear to my heart. Specifically, I really like some of the early Disney character pinbacks. 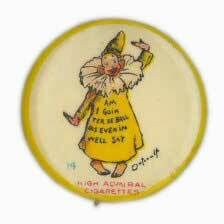 Probably my favorite series was produced in the 1890s by Admiral Tobacco, featuring Yellow Kid. It’s a large series, about 150 pinbacks, so it’s a challenge to put together. 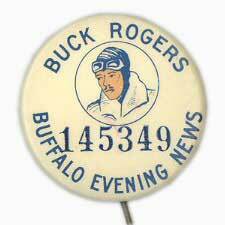 The heyday of comic pinbacks was definitely the 1930s. That’s when you had clubs like Little Orphan Annie that were distributing numerous pinbacks and premiums. 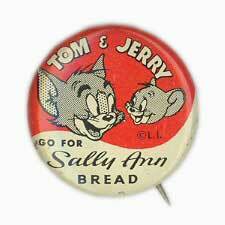 There were also alot of newspapers and interest in the Sunday funnies, so that made comic pinbacks very popular. 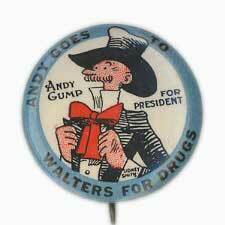 Other than the Sunday comics, pinbacks were used to advertise everything from food and clothing to movies and tobacco. One of the interesting things about the Yellow Kid pinback series is that it appealed to kids even though the marketing focus was to advertise cigarettes. So by all appearances, the tobacco companies were influencing young kids to smoke cigarettes by using a comic cartoon character. Collectors Weekly: What were some of the most popular comics to be used as ads? Lansdown: The Disney characters appeared on a number of pinbacks. Mickey Mouse was very popular and used for a lot of advertisements in the 1930s. Mickey became an advertising sponsor for bakeries, dairies, newspapers, ice cream, and all kinds of different products. Almost every popular comic character has appeared on a pinback in one form or another. Collectors Weekly: What did people do with the pinbacks? Lansdown: Not a lot of them survived over the years as you can imagine. They were free, so kids would play with them, wear them out, and then throw them away. A lot of pinbacks are quite rare. Pinbacks that are available today probably survived all these years because someone threw them in a drawer and forgot about them. Collectors Weekly: Who were some of the big pinback manufacturers? Lansdown: Whitehead and Hoag was the biggest – I believe they owned many of the original celluloid pinback patents in the 1890s. It was a really popular advertising medium in the 1890s and early 1900s, so numerous manufacturers sprung up, including Bastian Brothers and the Saint Louis Button Company. Whitehead and Hoag and Bastian Brothers made some of the most beautiful pinbacks, so those two manufacturers are at the top of my list as far as collectibility. Pinbacks were generally made out of three parts. There was a metal base, a circle of paper with the actual printed image, and a celluloid cover that wrapped and protected the image. Collectors Weekly: Who was the main audience for pinbacks? Lansdown: In general it was kids, at least for the comic pinbacks. 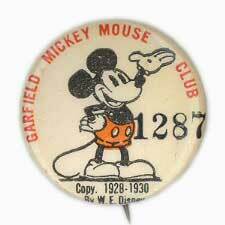 For example, a sponsor would put Mickey Mouse holding a loaf of bread on a pinback and kids would bug their moms to buy that brand of bread so they could get the pinback. That’s how the advertising worked. Celluloid pinbacks were produced from the 1890s up through the early 40s, when cheaper lithograph technology came along. This was just a piece of metal with paint, so they avoided the celluloid and paper. It was a lot easier to make than celluloid pinbacks, but I think they lost a lot of the beauty. Pinbacks are still popular and used today in advertising campaigns and political campaigns. Collectors Weekly: Are there a lot of pinback collectors out there? Lansdown: For political campaign pinbacks, there are probably thousands of collectors. For comic character pinbacks I’d say there are a lot fewer, maybe hundreds, which is nice for me because there’s less competition for the items I like. In terms of the hobby internationally, I have some European and Australian pinbacks, but primarily they seem to have been more popular in the United States. And most of the comic characters I collect were from American comics, with the exception of Mickey Mouse, who was an international star. Pinbacks have a lot of graphic interest, are relatively inexpensive, and are quite easy to store. Ebay is the place I find most of my pinbacks. There’s so much stuff on there and it makes it really easy for me to track down what I’m looking for. There are also a number of auction houses like Ted Hake’s that specialize in pinbacks, and those auctions are where you find the really rare pieces. There’s a show for political pinback collecting put on by A.P.I.C. (American Political Items Collectors), not just on pinbacks but basically any political memorabilia, and those shows draw a lot of dealers who deal in other types of pinbacks as well. Most pinback collectors are involved with A.P.I.C. because there isn’t anything else out there. Collectors Weekly: What are some key things you look for when collecting pinbacks? Lansdown: A lot of these pinbacks are rare, so I learned pretty quickly you can’t be too focused on condition. In the comic book world there might be hundreds of examples available for a specific issue, and you want to get the best example you can afford, but on the pinback side if you find something you want and it’s rare, you have to buy it no matter what the condition because you might not see another one for years. There’s no good price guide out there so it’s always a treasure hunt. Every time I browse eBay, I see pinbacks I’ve never seen before. It makes it difficult to know what’s rare or not, which is tricky. Collectors Weekly: What are some of the rarest pinbacks you’ve come across? Lansdown: Some of the Disney pinbacks with Mickey Mouse. There’s a Mickey Mouse Converse sneakers pinback, a Mickey Mouse soap pinback, and some rare Mickey Mouse Club pinbacks. They can all exceed four figures very quickly I’ve seen the prices get much higher while I’ve been collecting. Some of the Yellow Kid pinbacks have gotten a lot more attention so prices have also crept up. Very early Santa Claus buttons that were produced by stores around Christmas time have gotten really hot and those appeal to the Christmas collectors as well as the pinback collectors. Collectors Weekly: What are some good resources for pinback collectors? Lansdown: Ted Hake has offered a number of very good books on pinbacks; he has books on both advertising and political pinbacks. The best book out there right now on comic pinbacks is The Hake’s Price Guide to Character Toys. It’s primarily a toy guide, but nearly all the important comic pinbacks are listed in that reference as well. There’s also The Price Guide to Collectible Pinback Buttons, which was written in the 80s and is an invaluable book in my library. For the best information, you can’t beat talking to other collectors and buying and handling the pinbacks yourself. I’ve gained the bulk of my knowledge from other collectors. It’s a great hobby because pinbacks have a lot of graphic interest, they are relatively inexpensive compared to many collectibles, and they are quite easy to store because they’re so small. If you’re interested in related collecting areas like comics, Christmas, or politics, there’s probably a branch of pinbacks that will interest you as well. If you contact me through my website (www.marklansdown.com/pinbacks) and send a picture of your pins, I would be happy to tell you what I know about your collection. What do you know about the Philadelphia Badge Company? My great grandfather Jules Abrams was the founder. Grandmother Estelle worked there. “ ” The concept of sterilization changed the look of medical instruments forever.